THE mud crab wars have begun. 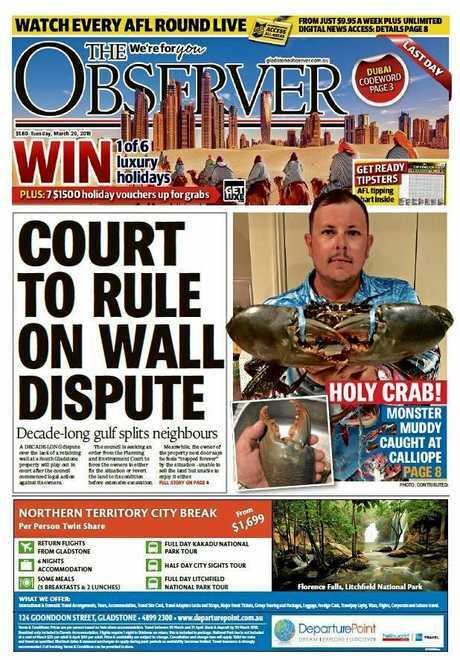 After Dan Wilson's monster 20.5cm, 2kg muddie made the front page of Tuesday's The Observer, Trent Albeck's mates knew the buck he hauled up last week was worthy of its time in the spotlight. The 44-year-old train driver has pulled up muddies since he was a kid, but knew he'd hit the jackpot last Tuesday at Gladstone's notorious, and fictitious, 'Beak Creek'. 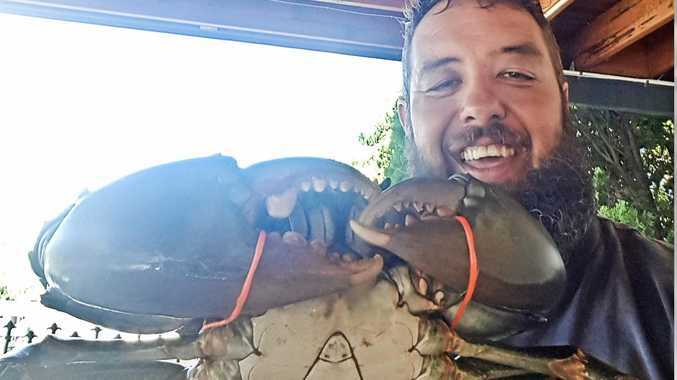 Trent's muddie measured 21.5cm across the carapace (the hard upper shell) and weighed in at 2.35kg - one centimetre and 350 grams bigger than Dan Wilson's front page buck. 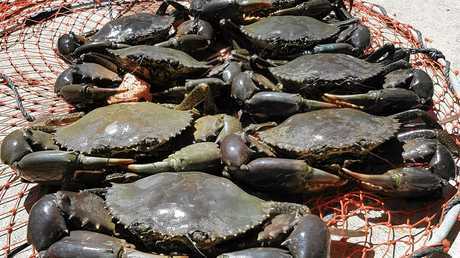 Mud crabs must be a minimum size of 15cm across the widest point of its carapace. "I was getting messages first thing in the morning and I hadn't even bought the paper yet," Trent said. "My mates were telling me to put mine in (the paper) because he's a monster." Trent has sent his muddie to a taxidermist in Rockhampton and expects to have the big buck back in 10 weeks. 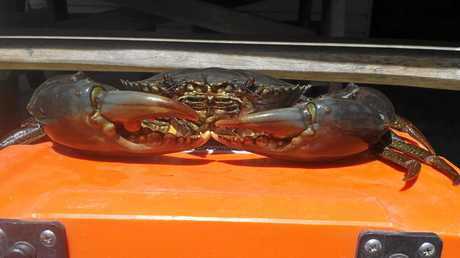 "The biggest crab I've ever seen in Gladstone was 2.1kg and that was about 10 years ago," he said. "So when we got him I thought that's a 2kg one for sure and when we weighed him he was 2.3kg and he was too good to eat." Trent was quoted $380 for the taxidermy job. "He fills it full of formaldehyde, it's very carcinogenic so he's got a properly ventilated room. It turns them bright red, not orange how we cook them," he said. "He cleans them all up, takes photos of them and airbrushes them back to their original colour." 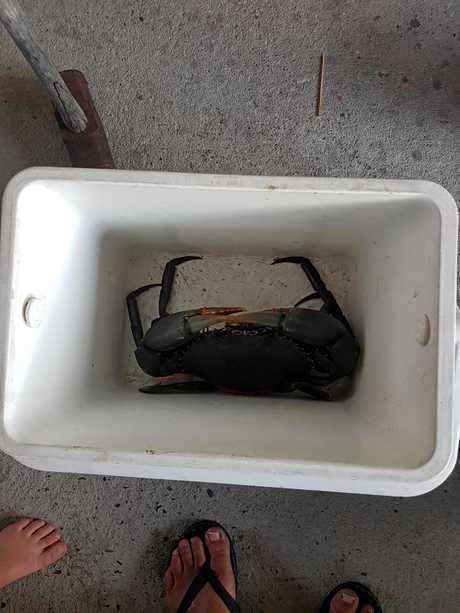 Chris French was another Gladstone resident who sent in his crab pictures after pulling up eight in one pot last Saturday. Like any savvy angler or crabber, Chris also caught his muddies at 'Beak Creek'. "My esky measures 38.5cm across and his legs were dangling over the side," Chris said. "I didn't measure or weigh mine though because he was way over legal size." Chris used an old fish frame as bait, but said Gladstone's muddies have a long history of not being fussy eaters. 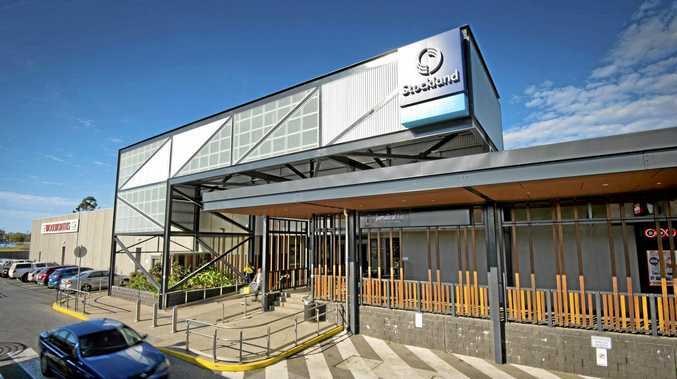 "Where The Observer office used to be across from the Reef Hotel...well long before that building there was a paddock with wild sweet potatoes and we'd dig them up and use them as crab pot bait," he said. "Crabs were that prolific you could catch them with anything. "It's probably not as good as it used to be 20-30 years ago but we're coming into best part of year for them."